We’re out on the street near the Metro Station of the Burgemeester de Vlugtlaan in Amsterdam. 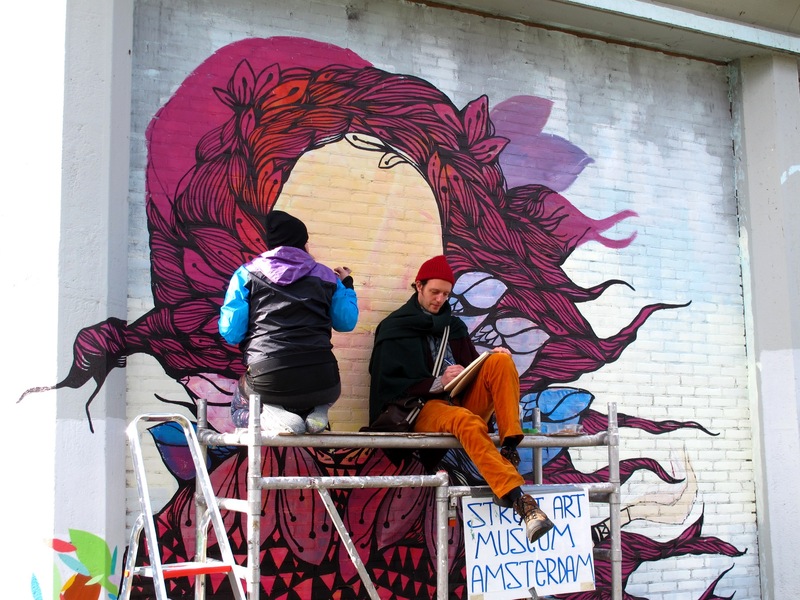 In a four-day session, artists Pau and Skount are working on a joint mural showing the Goddess of Spring and the Tree of Knowledge. Anna and Dianne, local residents and the facilitators of the Street Art Museum Amsterdam, come and go with nourishment, tools and information. Anna’s dog Pinky Bandita runs around, constantly on the lookout for fun, nourishment and her boss. Protective transparent foil donated by the Brandeis shop around the corner covers the pavement and blows in waves, releasing a light plastic sound. It’s a sunny day, but there’s a slight misty ambience among the trees behind us. “A little bit of dark on the top?” asks Skount. “Yes”, answers Pau. They pick up their three meter rollers and add a new tone to the turquoise that now covers most of the bricks. A black golf drives out of the neighbourhood around the corner. In it sit two North African looking young men. The driver halts and opens the window. “So beautiful!” He calls out with a big smile. “Will there be birdies on it?” I translate it for Pau. “Yes, there will be birds. It’s my theme.” she answers. She seems a bit surprised. “Great!” he answers with delight. “I love birdies!”. He raises his thumb out of the window and hits the gas. “We now have a scaffolding!” announces Anna. We go pick it up at a shop a block away. We don’t need to pay rent, just a deposit. “Everything for the art” says the owner. With Anna’s input, the setting takes shape in an organic way. The residents participate, exactly how she wants it. By doing this, she attracts the specific type of artistic talent she thinks is important to have around in the city. Graffiti art as we know it, Anna explains, started in the fifties when three elements came together. First, with the upcoming of Rock ‘n Roll, there was the aspirational figure representing new ideals. Second, there was graphic design, that gained force with advertising. The third, very important element was the invention of aerosol spray in mass car production. The owner of a garage told a young boy to learn how to work with a spray can. He did, and got skilled in it. In the seventies, he got bored with that and started climbing trains to draw tags of his name on them. You can imagine the impact of seeing a train pass by with a creative representation of somebody’s name on it. In the eighties it became public, and graffiti artists from all over the world picked it up. Some claim that those who had the letter “S” in their name were appreciated more, because that was the hardest letter to write. It’s not straight. Artists refined their skill, then the industry picked up, and adapted the choice of materials. Todays Prada, for example, have invited seven street artists to help them design the 2014 line-up. One of them, Stinkfish has murals in our museum collection. Banksy came much later. He was smart. Banksy added anonymity and used it for publicity. He placed himself out of space. It was an unusual new way of presenting yourself, which intrigued the audience. “But he is driven by political messages, by narratives, not by art.” Anna is quite sure that Banksy is not an individual, but a media schooled collective. Nonetheless, this identity inspired others to move on. Anna has critique on some modern street art movements, that she calls “Piss and run”. “Our neighbourhood doesn’t need another smart writer who draws something on a mural, then leaves. It needs love and care”. That’s why she is setting up a public museum with the purpose to teach visitors about the background of street art, freedom in public space and the messages of the artists. “Our project gives the opportunity to make something bruised and damaged into something lively and colourful”. The ambition is to create a space that is available, interesting and engaging. This way, Anna and Dianne have attracted Pau and Skount, who are each painting their new work on a side of the wall. I climb on the scaffolding and sit next to Pau. It’s no problem if I join her, she says, because she draws lines slowly. During our conversation, we have to climb down and up several times, either to reposition the scaffolding, or because Pau wants to have a chat with the passers-by. She takes a picture of those who allow it and writes down their e-mail addresses. She’ll place the pictures on her site and will send them the link, making the inhabitants part it. Thanks, Dianne, for the picture! For Pau, this is a beginning of a long-term art project called “PROJECT WALLFLOWERS”, which, starting this year, she’ll perform in some countries in Europe and in Tunisia. “The people are wallflowers” she says. “They are coloured dots on a big grey wall”. Her paintings are the bridge by which she connects with the people, her chance to communicate with the world she travels in. “As a kickoff, this wall is very important to me because I’m trying to figure out how to merge different things”. Pau was born in Chile but as a young child she had to flee abruptly with her family. She now regularly visits it for longer periods of time. “The culture of Latin America is very connected to the earth and nature.” Pau likes the fact that on that continent there is not one dominant theory on how life as we know it originated. Stories differ according to people’s location and tradition. “My life is a patchwork”, she says. “I am looking for who I really am. Not in a scientific way, but more in a spiritual way. I’m looking for my way to get in peace with it. When I started this work, I tried to find out which was my patch. But every time I travel, I discover that this new place also is an aspect of me. We are not just a passport, we are everything.” Myths and traditions help her to get in touch with herself. “Old mythologies are our base, we should try to keep them alive”. Pau tries to be a good professional and a good artist, but perhaps more than anything, she tries to find beauty in every day things. “I hope to inspire people to be conscious of the life around.” She describes a difference between when she is working in her atelier on her own and when she is out on the streets. “The atelier is more intimate, more personal. I open myself in a deeper way. But walls are more interactive, more open, I want people to be part of them. It’s the moment to learn from others.” For Pau, one way of working can not exist without the other. Skount is drawing the Tree of Knowledge, named Yggdrasil, also originating from Nordic mythology. He has previously made many murals with references to Greek mythology, the fascination of which he got during his time in Greece. “I like to take myths from the past, and compare them to what is happening now.” he says. “Those old stories are usually about us.” When Pau was invited and she said she was going to do Freya, Skount studied some Nordic tales to match his piece with her part of the mural. He read about Yggdrasil and instantly appreciated the character. Skount grew up in the town of Almagro. Almagro is characterized by the yearly theatre festival. From early age he found it fascinating how people’s behaviour can change when all they do is to put up a mask. For a long time, masks have taken a central place on the faces of his mural characters. “Everyone wears a mask in the metaphysical sense.” He explains. “You never see people’s true faces immediately. Masks help you to be accepted in society. I am moving away from that theme and look for what is real in people.” So far, he has painted two murals with people without masks on. His first one, Inner Colour, represents the moment where a mask is dropped and the true colours come out. Now, with the death and rebirth represented by Yggdrasil the time starts in which he investigates that which is inside people. Our own myths. Things keep moving on the street. People come and go, Anna and Dianne keep us up to date the latest announcements regarding journalists and politicians involved, painted cars drive by. Anna serves cookies. 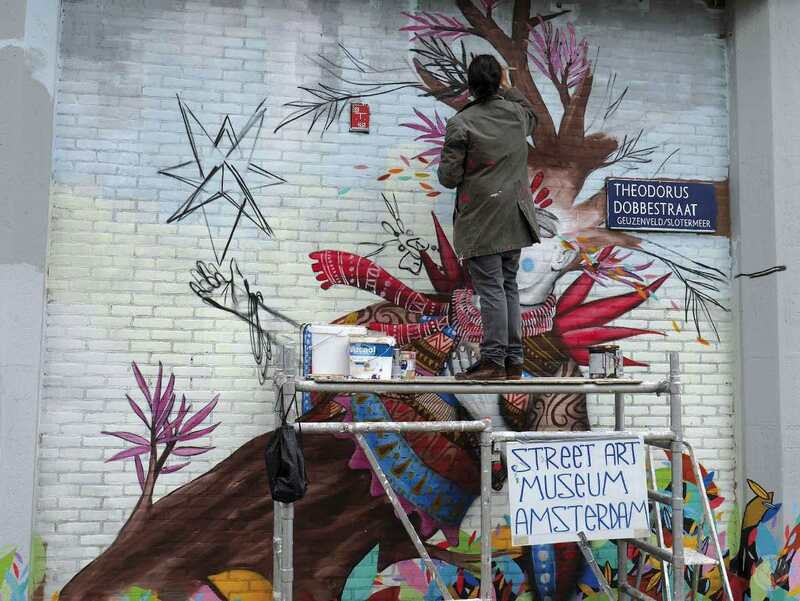 Together with the artists, she will keep colouring the walls of Nieuw-West. She gives tours for visitors to enjoy the paintings, accompanied by her animated and informative talks. Pau will soon go back to Germany, where she will continue making beautiful paintings indoors and outside. Skount will stay in Amsterdam for another while. He likes it here. This street adventure has been a beautiful experience to me. There is no better way to meet great people than witnessing them turn something abandoned into a piece of art.